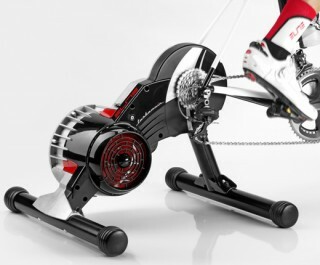 The Elite Turbo Muin is a super-efficient cycle trainer that uses a direct drive mechanism in which you remove your back wheel and fix your bike directly to the trainer frame. The resistance unit itself uses a fluid brake, which makes the Turbo Muin the world’s only fluid direct drive trainer on the market. 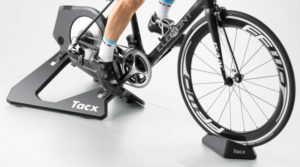 The fluid resistance unit means this trainer is quiet, in fact Elite say the only noise you will hear is that of your bike and not the trainer. 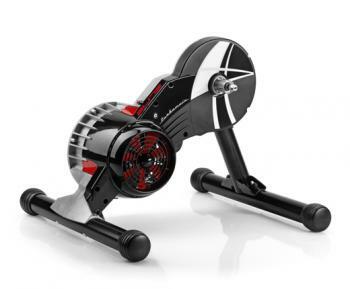 The flywheel is held internally within the trainer and provides a smooth road-like pedalling experience. 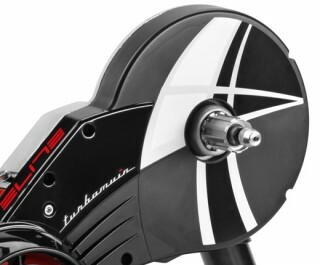 The Elite Turbo Muin turbo trainer offers a high power output, and is suitable for road and MTB bikes with Shimano 9/10/11 speed cassettes. You should check with Elite that your bike is compatible. Visit Elite here. The Turbo Muin is compatible with the Elite ‘My Training’ app, which outputs various performance metrics such as cadence and power. Note that extra sensors may be required to work with the app.